Hello. I'm the Annoying Bugbear but you can call me 'Chief'. I have a fascination for orcs, bugbears and anthropomorphic characters that I want to create games featuring these creatures as playable characters. I write mostly gay fiction so don't be surprised that you'll see lots of gay romances in my upcoming game titles. Why does my avatar look familiar? 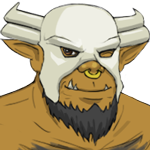 My avatar is based on the Bugbear Chieftain from Dark Alliance: Baldur's Gate.